Time is an enemy or an ally. Hanging Slit bio fireplace designed by Gabriele Bavastrelli will always point the appropriate relaxing time. 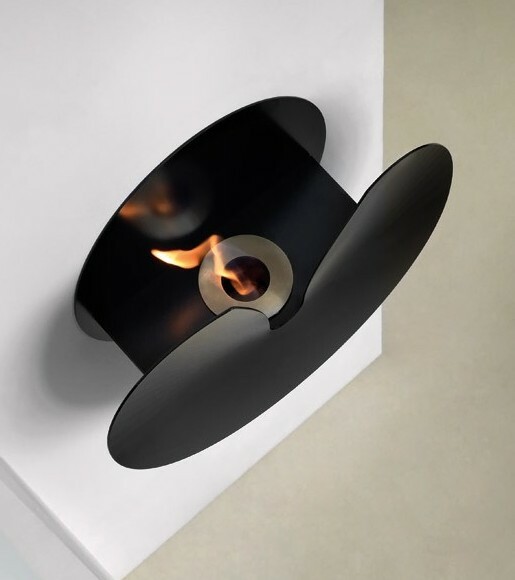 Slit bio fireplace by Caleido is characterized by round shape of the enclosure and burner, that aren’t standard models. The flame can be seen through the crack – the hole on the top of the “clock”. Elegance, decorative finishings are the perfect supplements in classic interiors. Fire closed in the circle is a symbol of the end, closing. The idea fills up the arrangement of every modern apartment. The time, closed in Slit bio fireplace, symbolizes the durability as well. It is perfectly shown by the materials used during its production. Using carbon steel, the enclosure of a device not only impresses in amazing and incredible way, but it’s also durable, resistant to delineation and cracks. Steel burner is aesthetic and elegant. It’s the guarantee of safe use for many years. Hanging Slit bio fireplace does not need the chimney-ventilation system or the permission for its use. It is ready for hanging immediately after taking out of the box. It can be used in every aired room. Small weight (16kg) allows to hang it somewhere else. Totally ecological bioethanol, used for combustion, does not produce smoke, ash and other harmful substances. The absence of fallouts, e.g. soot, eliminates the need of frequent and arduous cleaning of a device. Slit bio fireplace moisturizes air in the room and therefore it’s friendly for allergy sufferer.